Part 3 of a three-part series about Nate’s Bar Mitzvah. On August 5, 2017, in front of his friends, family and community, my son with a developmental disability celebrated his Bar Mitzvah. I have never been so proud to be his mom. 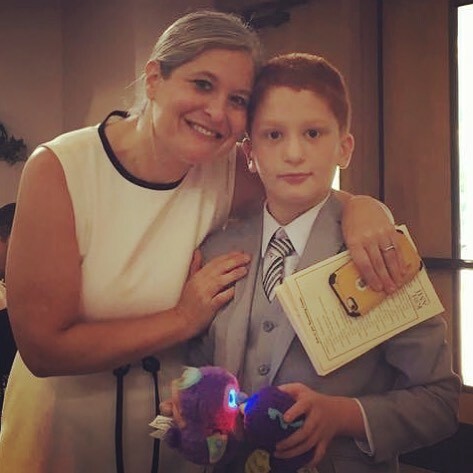 He didn’t read a word of Hebrew, he ditched his yarmulke half way through the service, and he never memorized any prayers in preparation, but Nate’s Bar Mitzvah was powerful, beautiful, and absolutely perfect. I loved every minute of it and wouldn’t change a single thing. With his red hair glowing and his talit draped unevenly over his narrow shoulders, Nate was a vision of Jewish adolescence. He was sweet, he was funny, and he looked smashing in his five-piece suit. He was fully engaged in the ceremony from the minute he hesitantly stepped up to the podium until the very end when he gleefully shoved an entire loaf of challah into his mouth. For almost an hour Nate was celebrated by his community and his loved ones. He was showered with love by the people who matter the most to him. He was acknowledged as the Jewish adult he had become. He did a beautiful job helping the Rabbi lead the service and he made his family very proud. Don’t misunderstand me though — Nate was, as always, authentically Nate. In between successfully telling the congregation when to stand and when to sit, he screamed loudly into the microphone. While he managed to control his urge to touch the Torah, he did partially unzip my dress as I stood in front of the congregation. He asked for his iPad more than a few times. And did I mention he shoved the entire challah into his mouth? But that is where the true magic happened; when Nate’s antics and behaviors didn’t disrupt the service; when the faces in the sanctuary didn’t turn to frowns or looks of disapproval; when no one hushed him, made him settle down or urged him to sit still; when the Rabbi didn’t discourage him. Not a single person judged him or questioned his right to be there. No one tried to politely ignore his behaviors. No one was inconvenienced or annoyed. Instead, the entire room chose to enjoy the ride. Seventy-five people, at the exact same time, saw Nate being Nate, and loved him because of it. My vision as I planned for this event was that Nate would keep his most challenging behaviors hidden from his guests. I imagined an hour of him sitting quietly in front of the congregation as friends and family prayed in his honor. As the day got closer the butterflies in my stomach grew more persistent because I knew in my heart that vision was unlikely to become a reality. Nate is so many incredible things, but a quiet sitter and passive observer are just not some of them. I had built a dream based on a fantasy, and my sense of dread as the big day approached was overwhelming. Of course when Nate is involved things rarely go as expected. It turns out that the reality of the day far exceeded my expectations precisely because Nate was his most genuine self. His happiness was contagious. The pride he exuded was irresistible. His mischief was entertaining. His charm and charisma were captivating. He put everything he was feeling right out there for everyone to see, and we all felt it with him. We honored Nate by allowing him to be himself, and like I said, it was amazing. After the Torah has been read and the speeches have been given, a Bar Mitzvah traditionally ends with family and friends shouting Mazel Tov while throwing candy at the guest of honor. At Nate’s Bar Mitzvah we decided to do it a little differently. On August 5, 2017, an hour after the service started and many years after I first dreamed of this day, Nate was offered the basket of candy and given permission to start throwing. As he grabbed the individually wrapped gummies by the handful and hurled them as hard as he could towards the people he loves, he radiated joy. His eyes glittered and he smiled wide. He giggled and threw handful after handful at the rows of his guests. He was surrounded by people who loved him and accepted him and supported him. People who laughed and cried and dodged candy all at the same time. His friends, his family, his community, all devoted and embracing and loving Nate, grateful for who he is and for all the vital gifts he brings to this world. Nate may never be able to articulate it, but I know he felt it all. Acceptance. Pride. Achievement. Love. Coming of age. And that, more than anything else, is exactly what I always dreamed this day would be.